It’s getting to the time of year when any reasonably warmish, sunny afternoon is to be treasured; when the night starts falling before evening begins and it feels like the sky is sinking into the earth along with the flowers and leaves. So, when I had Monday off work and it wasn’t rainy or too cold, I had to go to the Don. Any November visit could be the last one until spring, and I wasn’t going to miss my chance to watch it all falling asleep. This somehow or other being the 21st century already, I brought my iPhone, and so when I saw what I thought at first was a dead leaf and then realized was a butterfly (in November!) I whipped it out and chanced it falling into the river to get a shot. The butterfly, amazingly, cooperated–even when I held the camera right in front of it. I picked it up. Its sticky feet tickled the back of my hand as it picked its way back and forth along my thumb, but it made no move to fly away. It was just after 3:00. 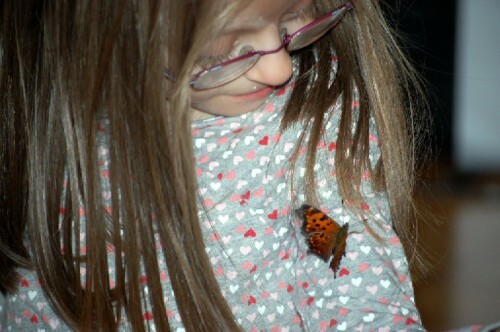 I will bring this butterfly to Frances at school, I thought. She’ll love it. 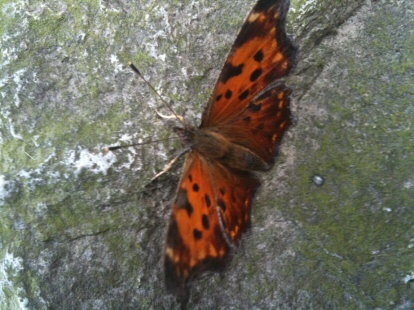 A butterfly in November! I can’t wait to see the look on her face. From that spot just past the third bridge coming from the Sheppard & Leslie entrance, I walked as quickly as I could, occasionally shielding the butterfly from the wind; but the whole time it made no attempt to fly away. It would spread its wings, or close them; turn into the wind or away from it; but no flight. Who knows? 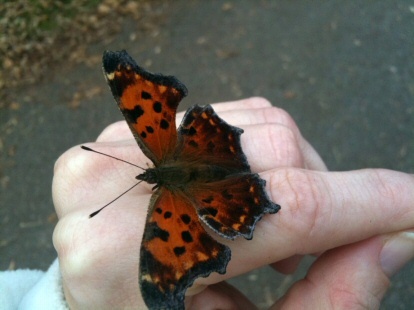 Maybe it liked the warmth of my hand. All along Sheppard I carried it, earning a few startled and happy glances from drivers or other pedestrians, all the way to Frances’s school, and to the door of her daycare room. “Can we bring it home?” asked Frances. On the walk home I held my hands lower so Frances could see her more easily. A butterfly! Such a pretty butterfly! Wasn’t it cute? Wasn’t it tiny? We should call it Butty. No, we should call it Tiny, on account of it’s so small. What a beautiful butterfly! Oh, that cute little butterfly. Mummy, can we keep it? At home Frances decked out a boot box with cotton stuffing and old leaves and I put in a plastic plate with a small puddle of apple juice on it. The butterfly flew around a little–I do think it’s old–but seemed mostly content to sit in the box on an old leaf and have the occasional sip of apple juice, its little tongue furling and unfurling, spiralling in and out again. 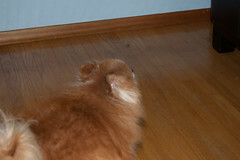 We admired her fur and her antennae and the way her little legs look like sticks. 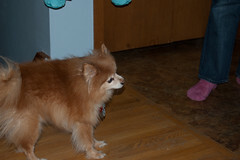 This morning, Butterdrops was still full of life and pep. She now has a bit of clementine too. The guinea pigs are very jealous. And no, we can’t keep her for long, but what an easy way to bring a bit of magic into a little girl’s life for a couple of days. A pet butterfly.